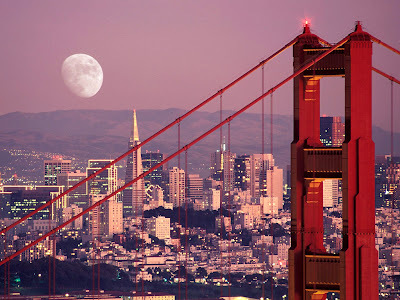 I am privileged to be spending the week in one of my favorite places: San Francisco. The city is famous among geeks for being more than the future home of Starfleet Academy; it also hosts the annual American Geophysical Union Fall Meeting (AGU). This is my fifth time attending the meeting in the past nine years, and each time I come back it feels like returning to a familiar home. The conference is the world's largest gathering of earth and space scientists. According to the AGU Fall Meeting Blog, more than 16,000 attendees will descend upon the Moscone Center to give 15,516 presentations in 1,293 sessions this year. Topics range widely from aeronomy, atmospheric sciences, biosciences, climate science, cryosphere science, education, environmental change, geochemistry, geodesy, geology, geomagnetism, geophysics, heliophysics, hydrology, informatics, minerology, natural hazards, ocean sciences, planetary sciences, public affairs, rock physics, seismology, tectonophysics, public affairs, and volcanology. Most of the presentations are in poster form rather than oral talks. With that firehose of information overload, it's easy to get overwhelmed. Luckily, the website has a handy meeting planner, or you can view the whole program PDF form. Early today, I attended the IRIS PASSCAL Data Archiving Workshop. It covered aspects of collecting seismic data in the field and processing it to make it archive-worthy. IRIS is the "Incorporated Research Institutions for Seismology", and they maintain the Global Seismographic Network (GSN), USArray, and PASSCAL programs. I was involved with four PASSCAL field projects during graduate school to deploy networks of seismometers in Fiji-Tonga, Antarctica, across North America, and the Northern Mariana Islands. The GSN provides crucial data to our operations at the Pacific Tsunami Warning Center where I work. This year I don't have a scientific presentation. Instead, I'll present an educational poster tomorrow morning titled "Use of Web 2.0 Technologies for Public Outreach on a Simulated Mars Mission" (ED11A-0565). It's all about how we communicated our mission with the public using our website and social media during the FMARS expedition this past July. You can view a PDF of the poster below. I'll present preliminary results from my FMARS and MDRS geophysics experiments at the Lunar and Planetary Science Conference in March. One thing that's new for me is that I'm registered on the meeting's Blog Roll, so I'll be writing about my AGU experiences this week. I even get a special blog sticker to wear on my badge that is supposed to help me strike up conversations with people about scientific blogging. There are many geobloggers at the meeting, and we've arranged to have a geotweetup gathering at a bar tomorrow night. It'll be good to put a face to some of the people I follow on twitter. AGU is also hosting a geoblogger lunch for us on Wednesday. As the week progresses, I plan to write more about some of the interesting science I learn and people I meet. How is this conference in terms of being green (paper hand-outs and such)? However, vendors in the expo are not subject to these restrictions. I imagine there will be many brochures and handouts there. Thanks for the compliment. I'm looking forward to meeting you too. If I could do FMARS over, I might use Panoramo instead of Picasa Web Albums to share the geotagged photos. We might do this on our crew, although we're already set up to Flickr, which also has a good feature to map geotagged photos. I geotag pictures for fun, and one of the more powerful programs to do that on a PC at least is GeoSetter (www.geosetter.com). Location data, once saved in the image can be shown anywhere (I think even Flickr has a map view). Hey, my hometown! Glad you're enjoying it, LOL... awesome poster!